Tamer Union: Happy 10th Anniversary, Digimon Next! A few hours ago Japan's clock rolled over to December 17th, 2015, marking the ten-year anniversary of Digimon Next's first publication. Written by Hamazaki Tatsuya (One Piece, .hack//G.U., STEINS;GATE) and illustrated by Okano Takeshi (Hell Teacher Nūbē), the manga was serialized in V Jump magazine until December 21st, 2007, and later compiled into four tankōbon volumes from 2006 to 2008. Written as a classical Digimon alternative to the then-controversial Savers, Next emulated the style and aesthetics of previous Digimon seasons, as well as of its predecessor V-Tamer 01. 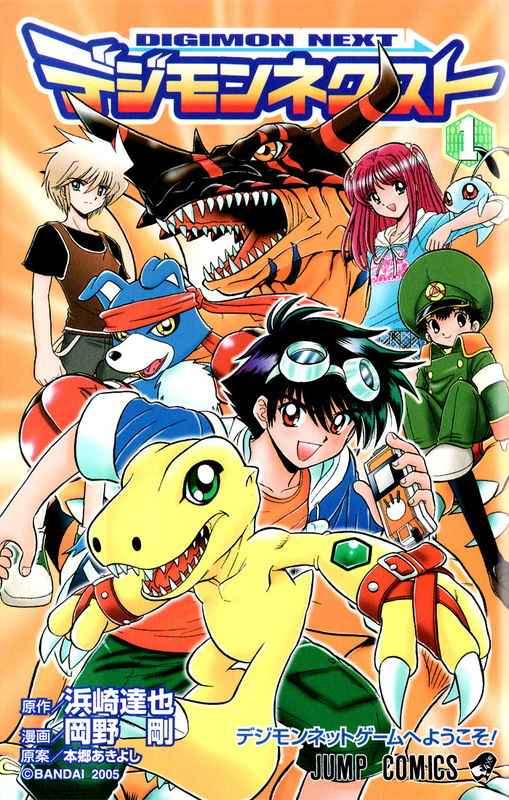 Unlike the late-middle-school-to-early-high-school characters of Savers, most of the cast in Next are elementary-age; the manga followed fifth grader Tatsuno Tsurugi on a quest to save the Digital World from the Demon Lord Barbamon, emphasizing the same strategic elements as V-Tamer but featuring the newer Digimon used in Savers. Next promoted the latest virtual pets, beginning with the then-new Digimon Mini, moving up to the Digivice iC, and finally to the Digimon Twin. While it focused on the Savers-era Digimon, Next diverted from the anime at several points, avoiding the use of Burst Modes in the storyline and instead using alternative evolutions derived from the Twin. The manga went on to outlive Savers by nine months, ending its serial run just prior to the second death of the Digimon brand in 2008. Although Next was never officially brought over to the west, the manga was fantranslated very close to its original release schedule by several groups, jumping from the late Digimon Himitsu, to WtW Scanlations, DATS, and eventually Digital Starlight. It was one of the Digimon fandom's first manga translation projects, alongside V-Tamer. These translations are still easily available on the web through a variety of hosts.